Who Should Be the Digital Disruptors? Marketing, Sales, Customer Service or CEOs? In thinking about the value of the information companies can obtain about their customers, their products and services, etc… from structured and unstructured data, who do you think should lead this effort in an organization? Each department – Marketing, Sales, Customer Service / Contact Center professionals can all do their part, but often are not high enough in the organization to drive widespread change that is required to get the results from digital disruption. I had a really great conversation with some of the best thinkers in the world at IBM who are working on Watson and it got me to thinking more about the issue of getting companies started down this path and who really should lead it. I’d love to hear your thoughts. Do you think CEO’s or CFO’s or COO’s really understand the value that can be obtained by this data? Do they see the opportunity to use it to become a company that lives in an ecosystem where their are no other competitors, i.e., the competition is irrelevant? 3. And in the end the data will change your business model and how your functional departments collaborate and your products and services will be get better from all this structured and unstructured data if it is turned into actionable insights so that you can create a blue ocean strategy where your company is in an uncontested marketplace where the competition is irrelevant. But for that to happen, it has to be driven by folks who are not too low in the totem pole, but rather by those who have the positional power to really drive this digital disruption change. And I believe, unless and until the CEO, CFO and COO change the metrics the functional departments get measured on, people will keep doing what they are doing. Who is going to be the instigators in this new digital disruption? Come join us at our Connected Enterprise Conference to hear how other leaders are dealing with the questions. VP and Principle Analyst, Covering Marketing, Sales and Customer Service to Drive Brilliant and Lastly Customer Experiences. 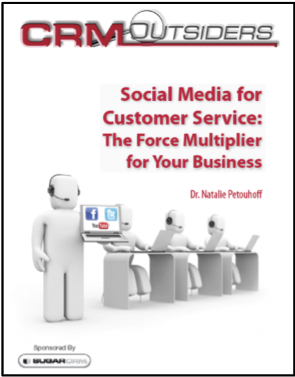 I’ve been writing about many force multipliers that are currently present within Customer Service organizations using social media. Socially-enabled Customer Service can affect every aspect of your business when leveraged as a force multiplier. There are multiple benefits from social throughout the buyer-seller relationship. It can be used to generate leads and build customer interest. It can be used in the sales and marketing process. It can be used to monitor customer satisfaction. It can be used to ensure that customers have their support issues addressed and new product functionality requested. It can help PR by helping to protect the brand. And it can be used to understand when an existing customer is influencing potential new customers. However, if you pull the socially-enabled service aspect out, the force multiplier effect does not exist. A break in the process leaves an opportunity for social media (or the failure to use it) to broadcast your shortcomings in the relationship with your customer. It is important you understand the force multiplier advantages— starting with the Customer Service aspects of your business. Take a note from a famous pilot, John Boyd and his OODA process and make sure to use social media to observe, orient yourself to the new information you observed, make decisions on that real-time social media data and take the actions that will forward your business, exponentially! For the whole story on OODA Loop and How to Use Social Media For Business download the white paper here. Question 1: Do you have systems to monitor/measure what employees and customers know, think and feel about how customer service is provided and how the rest of the business operates? And do you take that information and integrate it into your company and make improvements that deliver better products, services and, in particular, better customer service? If you think about it, this is very similar to what W. Edward Deming was suggesting when he provided business advice to companies. The fact is some companies collect feedback, but that information rarely gets to the right department or person who could make use of it. And then if it does get to the right person, there are not systems or a process to use that insight to make improvements. And even fewer companies tell customers and employees when they have taken the feedback into consideration and made the right changes. One of the most powerful things companies can do is to let customers know that they care by not only making changes, but to let customers know their voice was heard and taken seriously. Question 2: If you do listen and act on customer/employee feedback, do you do it faster than your competitors? If you do, you’ll have a decided time advantage over their competitor. Question 3: Are we on track? In military operations, OODA takes place in seconds. In corporations, it’s much slower. In fact, the current year’s strategy is rigidly followed till next year’s planning cycle. What companies need to consider is that with the real-time web, waiting a year to make a change is too slow. 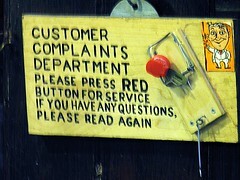 In fact, waiting a month or a week may take a customer service issue, spread by social channels, into a PR nightmare. Consider stories like United Breaks Guitars as one way that customers are fighting back against what they perceive is poor customer interactions. It’s critical to validate we’re on track or correct it. Especially in the Age of Social Business. Question 4: Do you take feedback, fix what is not working and then repeat that process over and over? In OODA theory, its It not just about going through the OODA loop once. It’s about seeing the OODA Loop as a continuously, on-going process. And then the result of your actions provides the observations to reorient what you decide to do next. Most companies think of Customer Service as a cost center. But what if Customer Service was a way to preserve and generate revenue? Customers are at the boiling point. They no longer want to take what’s handed to them, especially when it comes to Customer Service. And with social media they have a way to make their voice heard. If we go back in time, people were predicting there would be a technology that would allow customers to talk to each other. And to talk back to companies online when they are dissatisfied and that everyone would be able to see that negative interaction. That prediction was written about in the book The Cluetrain Manifesto. What does a “broken OODA loop” look like? If the product development team leveraged Customer Service staff and social media data to track these comments—the product development team would be much more aware of what customer’s think about the company’s products and services and be able to create them better. Customer Service Think Tank hosted by Dell (Photo credit: Dell’s Official Flickr Page)could create new functionality and even develop a new product that customers really want and are ready to buy. Talk about being proactive to your customer’s request— now, this is customer responsiveness! Imagine a customer tweeting that your company fixed a problem or created a product based on their request! Imagine how many more products you’d sell if you created products your customer’s actually asked for. The Conclusion? Force Multiplier #6: Create extraordinary customer responsiveness, build products based upon customer request tracking through customer service, create positive brand image via product development. Is Foursquare’s Bubble About To Burst? Do we have a broken OODA loop? Or are we just stupid? For the whole story on how to use the OODA Loop as a unique way to use Social Media to improve Customer Service and PR, download the white paper here. Or read on… Social Media for Customer Service affects Public Relations. Public relations departments might be considered at a slight disadvantage with the advent of social media. They have been able to craft and control the branding and key messages, which is very important to the brand equity. With social media, while they can release information to broader audiences quickly, negative information can spread just as fast. What if an overzealous blogger gets wind of your new product and blogs about it before the launch? On one hand this could be called a “sneak peek.” On the other hand, if leaked too soon, it might end up tipping your hand to the competition and even the stock market. In today’s social media environment, there is no way to protect the company 100 percent of the time from info leaks. But having crisis mitigation strategies in place for when it might occur is necessary. On many occasions, it is the Customer Service personnel who have alerted Public Relations about “sneak peek” news first. It is also known that some PR strategists give first news of new products or offerings to the most loyal customers as a reward or to get feedback pre-release. The customer database and its metrics are used for selection of those customers. Conclusion? Force Multiplier #5: Proactive monitoring of PR events and leaks, leverage customer feedback and customer data to facilitate customer loyalty. For the whole story on how to use the OODA Loop as a unique way to use Social Media to improve Customer Service, download the white paper here. Or read on… Social Media for Customer Service affects Marketing. to who owns the company’s social media presence. Studies show that Public Relations, Communications, Marketing, Customer Service and even Product Development will make claims to own this territory. It only makes sense to have alignment in the organization as to who will manage the various functions of social media, and create a common voice and governance rules over the communication policies. Also, cross-functional training is required to have all departments understand each other’s role. For most companies this would be a first! From social Customer Service perspective, they are fundamentally looking for potential problems and solving them. But because Customer Service is the place that a company can learn about the real-time use of their products and offerings, it’s the best pace to suffer information that can be used in other departments like PR, Marketing, Product Development and even Billing. Sometimes customer’s contact customer service because their bill is confusing. If that information is conveyed to Billing, they can work on making the bill more understandable. Perhaps an inordinate amount of customers are dissatisfied with the pricing of a product. That information can be shared with Marketing and Sales, especially if trends are developing. Because of the fast pace and ever-changing landscape of social media you can never have too many eyes watching for trends that may go unnoticed by busier internal groups. If Customer Service aggregates data from all communication channels to gives it to the various functional departments, they can provide the company with mission critical, competitive business insight. For the whole story on how to use the OODA Loop as a unique way to use Social Media to improve Customer Service, download the white paper here. Or read on… Everyone knows that a customer most likely will not buy from you if they are angry with you. So if customers are complaining about your product or service within social media and no one is available to address those complaints quickly, others will read the complaints. These complaints might be in the form of an online review, often on a third party site where you can’t take the content down. (Note: its generally not a good idea to take negative content down, even if its on your site and you could. Doing so makes the company look like they are trying to hide something and thus not being transparent or honest. If that happens, a firestorm of comments can result and be worse than the initial set of comments. Just know that if you are a company in business, there is probably someone who has said something negative about you online. That’s going to happen. What matters is what you do with the comments. Best practices are to go and address customer’s issues. Say you are sorry they had an issue and ask them how you can help. Some customer may have moved on and there is nothing you can do. Other’s will respond and at that point, take the interaction offline- to a phone call. Resolve the issue and you’ll see that customers are so completely caught off guard by a company being nice and doing the “right” thing, they will often go back and repost a comment about how they were wrong about the company and how great they really are. Now imagine your online posts. If you haven’t addressed them, sales will suffer. Customers will see the comments and not want to deal with you and look for products/solutions elsewhere—and even buy from another company. And what’s worse is your brand name could be damaged. In today’s real-time social media response environment, excellent Customer Service and rapid response to complaints is a huge differentiator over the competition. Your Customer Service organization is highly trained to interact with customers via all channels of communication and from a common knowledge base. Therefore, using Customer Service to oversee social media activity is not a stretch. For the whole story on how to use the OODA Loop as a unique way to use Social Media to improve Customer Service, download the white paper here. Or read on… In fact, in some companies, staff is already out there doing it. You’ll want to consider creating social media governance policies and social media Customer Service training required. Using a search engine, search on “social media policies” and you’ll see that hundreds of companies have put their social media policies online. This is a great resource for you and can provide you with a benchmark of what companies are actually doing. hundreds if not thousands of calls to the call center. It can be as easy as putting out a post in Twitter and/or on Facebook to say you know there’s an issue and you are working to resolve it. And companies also place links to solutions, where customers can go and get self-service or updates. What customers want to know is that you are paying attention and you have their back. Conclusion? Adding social media is a natural extension of what customer service agents already do. Force Multiplier #2: reduce the impact of customer service call volume explosions by utilizing Social Customer Service. Customer Service is in an “always on” state and is available to your customers. When the 1% engage them, they are more than happy to provide answers—and great answers—sometimes better answers than your own staff. Some companies are worried about interacting with evangelists because they might not give the right answers. In communities that are strategically set-up, the customers can vote on whether an answer actually helped them. When you have hundreds of people voting on an answer, you don’t have to worry about accuracy of the answers. The crowd tends to allow the right things to float to the top! Using brand advocates can help to reduce the calls to the contact center, provide better information for your knowledge bases and thereby make your agents smarter and able to handle questions faster.